Waffle House wants to disrupt more than just your stomach as it partners with parcel delivery app Roadie. Described by the Wall Street Journal as the “Uber for package delivery,” Roadie pays people to deliver parcels as they travel, undercutting traditional services like UPS and FedEx. The idea is that you might pick up a package ahead of an upcoming road trip, and make a little extra cash by dropping it off along your route. An app for iOS and Android connects potential drivers with people who have packages to ship. Still, users could understandably be skittish about having a stranger show up at their house with a package in hand, especially as Roadie is still working on a system for background checks. The concept might be more appealing if there were a neutral ground where drivers could deliver their packages. Waffle House wants to be that meeting place. The diner chain says it will advertise the Roadie service with signage, and offer a free waffle and beverage to drivers while they wait for their pickup. 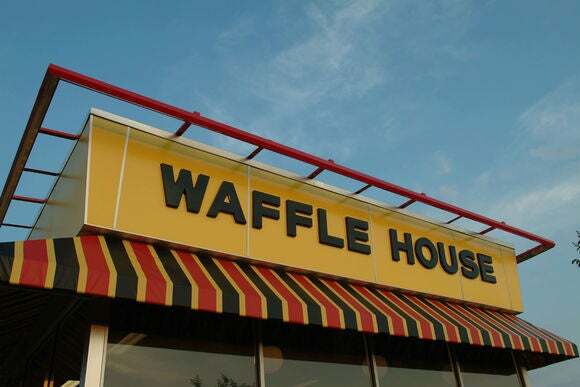 It’s unclear what Waffle House gets in exchange (besides the chance to tack on an order of hash browns smothered, covered, and topped for famished delivery people). As the Journal notes, the service raises questions about who’s responsible if any illicit goods become part of a delivery. Roadie’s current protections against this—along with issues of lost or damaged goods—involve taking a photo of the cargo before and after shipment, and offering insurance up to $500. Why this matters: A service like Roadie could easily become one of the more problematic “sharing economy” apps, overstepping its boundaries by spilling into businesses that don’t want to be used as package drop-off points. But rather than fight it, Waffle House is embracing the whole concept in hopes of drumming up more business. If the partnership with Roadie manages to get more people into Waffle House in broad daylight, it’s a win on the restaurant’s end.